A man is born like any other creature, except that he has the privilege of having a Teacher Mother and a Mentor Father. My Mother, was of course my first teacher. My Mother taught me Swara’s, Speech and the Mother tongue, introduced me to Mother Earth and taught me the most valuable, Aatmiyata, Empathy with which to connect to the people and the world around. For my Mother, the Aatmiyata was everything, with it you could even have the Hotline of connect with God Almighty. The father, my mentor inspired me to cultivate Knowledge as the Supreme Wealth that lasts till your last breath and even thereafter forever. My school and college teachers, gave me the mantra to know this magnificent creation and inspired me to serve the society with Capabilities, Competence and Character. My University teachers, mentored me to traverse the Path to Excellence and inspired me to cultivate science and contribute to advancement of technology. My spiritual gurus, that include Lord Rama and Lord Krishna and a great many whose magic touch made me to understand and admire the Spiritual Civilization of India. They inspired me to develop a profound interest in Life Divine and work consciously for the Synthesis of Science and Spirituality. My students, taught me to accept and respect change. They inspired me to Innovate and Excel. They gave me a hope that the world tomorrow will be a better one than the one in which we live today. They are my teachers to adopt the technology changes and a live a life full of excitement and hope. I continue to admire my teachers, who to me were the messengers of God Almighty, to shower upon me the bliss and blessings of Divinity. On this Day, Teacher's Day,I salute to Thee, for giving me a life full of Divinity and pay my respectful homage to all my teachers who gave me this day. We are very fortunate to be born in a country, Bharatvarsha, India where a teacher is regarded as more respectful than even the God Almighty!. How fortunate are we, the Bharatvasi, the Indians, I wonder. On this pious day, let us all pledge to make our country, Bharatvarsha, India, a Heaven on Earth and to live up to the teachings of our great teachers. Association of Indian Universities (AIU). Wage a war on Air and Water Pollution :Prof. PB Sharma, President of Association of Indian Universities. Born in April 1948 at Vidisha in Madhya Pradesh, Professor Pritam B. Sharma graduated in Mechanical Engineering from Samrat Ashok Technological Institute with a GOLD MEDAL of Faculty of Technology of Vikram University in 1969. He was sent by Govt. of India as a National Scholar for higher studies abroad and he obtained his Post Graduate Degree in Mechanical Engineering from University of Birmingham (UK) in 1974 and received the Post Graduate Prize for being the topper of the Engineering Faculty of University of Birmingham. He later received his Doctorate Degree in Mechanical Engineering from the University of Birmingham (UK) in 1978. Prof. Sharma is a man of vision and firm commitment and resolve to nurture academic and professional excellence in originations and Institutions to which he has associated himself during his 37 years long professional career. Mech. Engg. Dept. S.A.T.I.Vidisha M.P. Rotating Stall Behaviour of an Axial Compressor Rotor. Topper of 1974, Received the Avery Prize for Postgraduate Studies. First Class First, "Gold Medallist"
Distinguished Leadership Award by American Biographical Institute, USA. Professor Sharma spent 5 years at University of Birmingham, UK in higher studies and research. He was a Rolls Royce Research Fellow at Birmingham, where he worked on Surge and Stall problems in turbofan engines. Prof. Sharma was hand picked by IIT Delhi from UK to join IIT Delhi in 1978. Prof. Sharma worked in IIT Delhi for 12 years and rose to the position of Professor of Mechanical Engineering. During his 12 years at IIT Delhi, he made significant contribution to teaching and R&D in the areas of computer aided simulation and online studies of Power Generating Systems and Aero-Engine-Technology. He has guided 14 Ph.D scholars and has undertaken a number of major R&D Projects sponsored by the Government and Private Agencies. He offered consultancy to a number of reputed industries and organizations which include GTRE Bangalore and world renowned Rolls Royce of UK. His work on optimization of Thermal power plants and Contra Rotation for Surge and Stall free aero-compressors is highly valued internationally. Sharma P.B. et.al., “Surge and Stall Studies in an Axial Compressor", Res. Report No. IITD/ME/PBS01/89, AR&DB, Min. of Defence, March 1989. Sharma P.B. et.al., “Development of a Data Acquisition System for Flow Investigation in a Contra-Rotating Axial Compressor", Res. Report No. IITD/ME/PBS01/85, AR&DB, Min of Defence, March 1985. The report has been approved and accepted by Propulsion Panel for publication as Min. of Defence Report. Sharma P.B., “Investigation of Contra-Stage Performance", Res. Report No. IITD/ME/PBS02/86, Rolls Royce Plc. (UK), Nov. 1986. Sharma P.B., “Investigation of Contra-Stage Performance – Normal Fan", Res. Report No. IITD/ME/PBS02/86, Rolls Royce Plc. (UK), Nov.1986. Sharma P.B., et.al., “A Study of Rotating Stall in a GTX Compressor Stage using Hydraulic Analogy", Final Report CW – 38/84, GTRE Bangalore, April 1987. Railly J.W., Sharma P.B. & Ekerol H., “A Study of Radial Compressor Stall" Res. Report No. 179, University of Birmingham, Final Report to Nat. Eng. Laboratory (UK), April 1986. Sharma P.B., Papageorgeou & Railly J.W., “A Study of Anomalous Rotating Stall Behaviour of Axial Compressors", Res. Report No. 169, University of Birmingham, Final Report Rolls Royce plc (UK), Dec.1980. Sharma P.B. & Railly J.W., “Influence of Downstream Throttling Conditions on Pressure Field at the Exit of a Stalled Blade Row", Res. Report No. 163, University of Birmingham, (UK), March 1976. Sharma P.B. & Railly J.W., “A Note on Rotating Stall Stability Criteria", Res. Report No.153, University of Birmingham (UK), March 1976. Sharma P.B. & Railly J.W., “Some Observations on Stall Behaviour of an Isolated Compressor Rotor", Res. Report No. 154, University of Birmingham (UK), August 1976. Sharma P.B., “Investigations of Contra-Stage Performance – RR Contra Fan", Res. Report No. IITD/ME/PBS/89, Rolls Royce plc. (UK), Dec. 1989. Sharma P.B., “Investigation of Contra-Stage-Aeroacoustic Performance", Res. Report No. IITD/ME/PBS/90, Rolls Royce plc. (UK), Jan. 1990. Sharma P.B., “Investigation of Slip Characteristic of Drive Band for AIFS Projectiles", Res. Report No. IITD/ME/PBS/90, Min of Defence, Nov. 1990. Sharma PB & Sethi Vk, “ A Pilot plant development of 500kg per day CO2 Absorption and its conversion into Hydrogen, Methane and Bio-diesel", Dept of S&T, Govt of India, April 2008. Naveen Kumar & P B Sharma et al, “Development of an Efficient Biodiesel Reactor for Rural Application and Utilization of Multi Feedstock derived Biodiesel in Medium Capacity Diesel Engine", Completion Report, MNRE, Govt of India, Project No 7/36/2003-NT, Sept 2008. 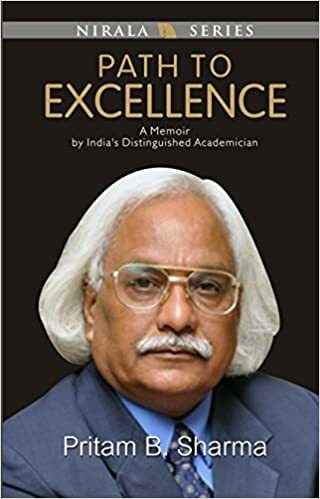 Renowned academician, Pritam B. Sharma's illuminating Memoir, Path to Excellence is a celebration of thrill, excitement, joy and bliss of infinite reservoir of wisdom that shines the adventurous life of the author. Born in a small obscure village in central India, Sharma's destiny to become an academician in shaping the educational avenues of modern India began with a brief encounter with a Yogi in his birthplace. Journals Assn. of Indian Universities Journal University News, Vol.35, No.5, Feb.1997. JournalsRail Business Report, Railway Gazette Year Book, 1997, pub. By Reed Business Information, U.K.
JournalsJr. of Productivity Promotion, Delhi 1996. JournalsApplied Thermal Engineering, Vol. 16, No.2, pp 189-192, 1996. Sharma P.B.Emran Khan M.,Singh & A. K. Tiwari G.N. Sharma P.B.Tiwari G.N., Sanjay Kumar & Emran Khan M.
JournalsApplied Thermal Engineering, Vol. 16, No.2, pp.189-192, 1996. Sharma P.B.Agrawal A.K., Dr. Sushil, & Das J. K.
Journals Long Range Planning, Int.Jr. of Strategic Management. Journals Energy Conversion and Management, Volume 38, Issue 8, May 1997, Pages 761-770. JournalsSAARC Economic Review, Vol.3 (1994) pp. 55. Sharma P.B. & Sharma R.C. JournalsSAARC Economic Review, Vol.3 (1994) pp 55. Sharma P.B.Sethi V.K, & Singh S.P. Journals Indian Jr. of Irrigation & Power, Vol.47, No.4, pp 21-30. Journals STAND Journal, Vol. V, No.1, July 1992, pp 30-34. Pundhir D.S., Sharma P.B. & Choudhry K.K. Journals Jr. of Power & Energy, 1 Mech E (London), Vol.204, 1991. Journals Jr. of Irrigation & Power, Vol. 41, No.4, Oct. 1984, pp 417-428. Railly J.W., & Sharma P.B. Sharma P.B.,, & Railly J.W. Journals Jr. Mech. Eng Science, I. Mech. E. (London) Vol. 22, Dec. 1981, pp 269-276. Journals Int. Jr. Energy Conv. & Mgt. (USA), Vol. 30, No.2, 1990, pp 187-202. Sethi V.K.,, Sharma P.B., & Gupta S.K. JournalsJr. of Thermal Eng., Vol. 4, No.2, 1985, pp 46-52. Sharma P.B., Jain Y.P. & Pundhir D.S. Journals JProc. of I. Mech. E. (London), Ser.A1, Vol.202, 1988, pp 15-21. Sharma P.B., Pundhir D.S., & Choudhry K.K. Journals Defence Science Journal, Vol.41, No.2, April 1991 pp 165-180. Sharma P.B.,, & Pundhir D.S. Journals Defence Science Journal, Vol. 42, No.3, July 1992, pp 191-199. Cultivating admiration in brands: Warmth, competence, and landing in the "golden quadrant"
Sethi V.K.,Sharma P.B., & Gupta S.K. JournalS Jr. of CEA, Vol. VII, 1985, pp 354-358. Sethi V.K., Sharma P.B., & Gupta S.K. Journals Jr of CEA, Vol. VI, May 1983, pp 22-31. Krishna V., & Sharma P.B. Journal Proc. I. Mech. E. (London), Ser. A4, Vol.202, 1988, pp 215-224. Journal Int. Jr. of Turbo & Jet Engines, 1988, pp 51-60. In this project, the compressor stage was simulated on a water table. Aerofoil blades for rotor and stator for the water table simulator are machined using a N.C. machine at IIT Delhi. The detailed performance of the stage was studied using an on-line signal processor. Under this R&D project the use of CNG for automotive engine was investigated to establish reduced emissions and improved engine performance. The work led to large scale utilization of CNG for transport vehicles. Under this programme, Bio-diesel reactors of 10, 100 and 600 ltrs per day capacity were designed, developed and commissioned in Bio-diesel Park of DCE. Extensive research has been carried out on use of biodiesel mix for automotive engines. Use of neat biodiesel for IC Engines for tomorrow‟s generators has also been carried out. At RGTU an innovative project of development of 80kW Solar Wind Hybrid has been undertaken under sponsorship of Min of New and Renewable Energy Resources, Govt. of India in 2007. The project is under installation. It comprises of 5 wind turbines each of 12kW capacity integrated with Solar power of 3kW and each separately connected to electric load of Street lighting, Boys hostel, Administrative block and two Academic blocks of RGTU. This is one of the high value impact project aligned to mitigate climate change by designing and developing a Pilot Plant for capture of 500kg per day of CO2 and its conversion into Hydrogen, Methane and algae based biodiesel. The project has been sponsored by Dept of S&T Govt. of India and is in advanced stage of its implementation at RGTU Green Energy Technology Park. (xi) MNRE 100 kW Solar Photovoltaic Project at DTU, Co-Investigator Dr. J.P. Kesari. Under this project a 100 kW Solar PV Plant is being installed at DTU to showcase latest technology developments in the areas of Solar PV. Under this project a 50 litres per day Biogas plant is being developed for installation near the DTU Canteen to utilize the kitchen waste from University Canteen and Hostel Messes. 1. BHEL Sponsored Seminar on Productivity Enhancement, 'Institute Industry Interaction for Product and Process Improvement', Feb. 1987. 2. Gas Turbine Research Est. Bangalore – April 1994, „Recent Advances in Use of Water Table for Compressor Stall Investigations‟. 3. Specialist Presentation at International Conference of AIAA, Beijing, China, September, 1985. 4. Pennsylvania State University (USA) – May 1986, Department of Aeronautics and Aerospace Engineering Seminar, 'Recent Advances in Unsteady Operation of Gas Turbine Compressors'. 5. Cleveland State University (USA), May 1986, 'Recent Advances in Unsteady Operation of Gas Turbine Compressors'. 6. University of Windsor (Canada), May 1986, 'Aero-acoustic Monitoring of Aero Compressors'. 9. University of Maryland (USA), May 1986, "A Technique for Thermal Power Plant on-line Performance Monitoring". 10. University of Maryland, June 1987, "Stall Suppression in Axial Compressors". University of North Carolina, June 1987, "Recent Advances in Aero-compressor Technology". 11. University of Southern Mississippi, June 1987, "Aero-acoustic Performance of a Ducted Contra-fan". 12. University of Birmingham, UK, July 1987, NEL Industry Seminar, "Stall Suppression in Radial Compressors". 13. University of Cleveland, Sept.1992, "Human Resource Development – New Challenges". 14. University of Southern Connecticut, Sept. 1992, "The World of International Business – Role of HRD". 15. Indian Plastic Industry, New Delhi, "Manpower Requirement of Plastic Industries", Inaugural Address for PG Diploma of IPI, 1993. 16. National Foundation of Indian Engineers, New Delhi, February 1993, Panel Discussion on "Future of S&T Education in Emerging Global Economy Environment". 17. National Foundation of Indian Engineers, New Delhi, July 1993, Key Note Address on "Quality & Productivity in Higher Technical and Managerial Education System". 18. Key Note Address, "Information Technology Vision 2000", International Conference organized by NAFEN, New Delhi, 1994. 19. Key Note Address, "Environment Challenges for India", International Conference, ENVIRO 2000, organized by NAFEN, New Delhi, 1986. 20. Key Note Address, "Frontal Areas of R&D in Science & Technology in 21st Century", International Conference R&D Vision 2000, organized by NAFEN, New Delhi, Jan. 1999. 21. Presidential Address, "Frontal Areas of Science and Technology relevant to 21st Century", Engineering Sciences Division, 86th Indian Science Congress, Jan. 1999. 22. Expert Presentation on "Challenges of Knowledge and Innovation Management", Engineering Sciences Division, 86th Indian Science Congress, Jan. 1999. 23. Expert Presentation on "Mechanical Engineering in the Third Millennium", ASME, South Asia Pacific Board Meeting, Tokyo, Japan, Jan. 1999. 24. Invited Address on "Funding of R&D in Engineering Institutions", Association of Indian Universities Seminar, RRL Bhopal, Sept.1999. 25. Invited Lecture on "Challenges in Information Technology Sector in India", IBM-ACE Centre, Indore, Nov.1999. 26. Invited Address on "Revitalizing Technical Education in the new Millennium", Annual Conference of Vice-Chancellors, AIU, Mangalore, Dec.1999. 27. Presidential Address "India Specific Challenges in Energy Sector", International Seminar on Global Energy Requirement, Institution of Engineers, Jabalpur, Jan.2000. 28. Invited Key Note Address "Challenges of Technical Education in India", National Seminar on Technical Education, Hitkarini College of Engineering, Jabalpur, Feb.2000. 29. Invited Lecture on "Impact on Information Technology on Nation"s Economy", WPC National Seminar on e-commerce, New Delhi, March 2000. 30. Convocation Address "Professionals of the New Millennium – meet the new challenges", M.P. Regional Centre, IGNOU, Bhopal, March 2000. 31. Keynote Address "Libraries and Information Systems in 21st Century", Nat.Conv., Indian Asso. of Libraries and Info. Centers, Bhopal, Nov.2000. 32. Keynote Address "Engineering Profession at Cross Roads", Annual General Body meeting, Inst. of Engrs. (India), Bhopal, Dec.2000. 33. Keynote Address on "Professional Morality and Ethics for Engineers and Managers" delivered at Institution of Engineers Annual General Body Meeting, Bhopal, March 2001. 34. Keynote Address on "Challenges for Indian Agriculture Scientist in the New Millennium", Institution of Engineers, National Convention of Agriculture Engineers, Jabalpur Centre, March 2001. 36. Keynote Address on “Mapping of Excellence", National Conference organized by IPER, Indore, September 2002. 37. Convocation Address, "Managing India of 21st Century" DPC Institute of Management, New Delhi, November 2002. 38. Keynote Address on “Mechanical Engineering in the knowledge age", 14th ISME International Conference, Dec 2005. 39. "Managing Knowledge and Innovations in the Knowledge Age", AIT Bangkok, Dec 2006. 40. "Empower Youth with the Wings of Knowledge", Convocation Address, NIT Surat, March 2007. 41. Keynote Address on “Mechanical Engineering in the new knowledge age", 15th ISME International Conference, March 2008. 42. Invited Address at IE(I) Delhi State Centre on “Synergetic partnership Between Academia and Industry for Excellence in Education, Research and Innovations", Delhi July 2008. 44. Invited Address at Consultation Workshop on “Use of Fly Ash", Sri Ram Institute of Industrial Research, July 19, 2011. 45. Invited Address at First International Symposium of APS on Sun Belt Development, Tokyo Institute of Technology, Japan, July 25, 2011. 46. Invited Keynote Address on “3rd Industrial Revolution – Indian Context", FICCI Mega Trends International Conference, Delhi, January 2012. 47. 47th Nidhu Bhushan Memorial Lecture on “India"s Engineering Education in Search of Quality, Relevance and Excellence" at 27th Indian Engineering Congress Engineering, 2012 at Vigyan Bhawan, New Delhi. 48. Invited Keynote Address on “Ethical and Professional Moral Foundation of Ancient India's Economic and Governance System", “1st International Conference on Vedic Foundations of Indian Management" at Haridwar, organised by ISOL and FMS, Delhi University, April 21, 2012. 49. Invited Keynote Address on “Strengthening Ethical and Moral Foundation in University Education – Role of Spirituality", Science and Spiritual Quest 2008, pp 11-20, published by Bhaktivedanta Institute, Kolkata. 50. Invited Keynote Address on “Integrating Capabilities with Values"